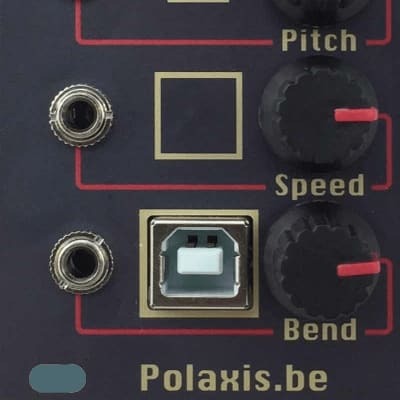 This module is performing real time LPC synthesis to produce intelligible voice or … not if you choose to. The module produces sounds in 3 major modes: Speech, Repeat and VCO. In Speech mode, the speech starts with a gate signal and complete before waiting for a new gate signal. The speech has the priority. In Repeat mode the speech starts and stops with the gate signal going high or low. The gate has the priority and the speech repeats while the gate is high. This mode is very useful to create crazy rhythms. In VCO mode, the LPC engine loops while the gate is high, producing steady notes. The VCO mode can also produce sound using white noise instead of tones, making strange throat sounds. The sound synthesis can be altered via CV signals to affect pitch, speed, bending. Talko is an Arduino-based synthesizer developed under open-source hardware and software. Its firmware can be updated via the onboard USB port. The module can be powered via USB if needed. A rotary encoder is used to select the bank, while its button can be used to simulate the gate going high and have the module speak when pressed. Please note that all CV pots are also acting as voltage attenuators. When using a CV signal you may want to turn the knob fully clockwise unless you want to attenuate the incoming signal. The switch as 3 positions to set the mode between Speech mode (position: up) , Repeat (position: middle) mode or VCO (position: low). In Repeat mode, the gate has the priority and the speech is active only while the gate level is high. Playing with the gate length or duty cycle allows making nice shopping effects. when Bending (note pitch) is turned to zero, the LPC tone is replaced with the white noise generator and the Speed affects the noise volume. CV signal in allows to choose the words or phrases to be said. Any change on the Sound entry reset the counter in bank N°8 and start a new transmission in Bank 9. If the mode switch is on Repeat , the gate will start the sound and repeat it as long as the gate level stays high. If the mode switch is on VCO, the gate will start a tone and hold it as long as the gate level stays high. If the bend is on, the bend pot … well, distorts the sound. Change the amount of bending or the pitch of the tone in VCO mode.